The flaws of the modern medicine patent system are widely decried. The current system fails to develop medicines to address the health needs of the global poor and creates a platform for unaffordable pricing of the medicines that exist. But even the harshest critics of the patent paradigm recognize the need to provide incentives for vigorous research and development of new medicines. Many alternatives have been proposed. Some are already in operation at limited levels. But these alternatives are poorly understood, even in the global health community. This article provides a brief review of the grievous defects in the medicine patent system and then summarizes the alternatives. 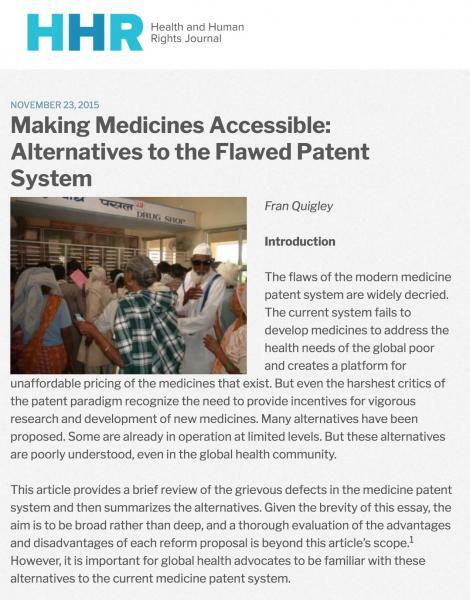 Given the brevity of this essay, the aim is to be broad rather than deep, and a thorough evaluation of the advantages and disadvantages of each reform proposal is beyond this article’s scope.1 However, it is important for global health advocates to be familiar with these alternatives to the current medicine patent system. Yet widespread frustration with the medicine patent system has not yet been matched by enthusiasm for specific proposals to replace it. These proposals certainly exist, and some are even in operation to limited extents. The following descriptions of “Plan B” alternatives proceed along a continuum, beginning with ideas that would cause the least disturbance to the current system and advancing toward more radical concepts. The TRIPS agreement represented an historic advancement of the patent paradigm. Monopoly protection for medicines became the law in many nations that had previously treated medicines as a public good off-limits from private profiteering.15 But TRIPS did include several substantial exemptions from patent protection, exemptions that came to be known as “flexibilities”. TRIPS flexibilities allow for a detour around patent-erected barriers that otherwise block access to many critical medicines, yet full embrace of these flexibilities would not change existing international intellectual property law. Many access to medicine advocates consider TRIPS flexibilities to be significantly under-utilized in low and middle-income countries. For example, the Fix the Patent Laws campaign in South Africa urges expanded use of TRIPS flexibilities.21 Thus, the featured reform in this category would be a significantly broader embrace of the patent exemptions already available under international law. Any alternative to the current system must provide sufficient incentives for the research and development of new medicines. Most comprehensive reform proposals aim to provide those incentives by some combination of “push” and “pull” mechanisms. The global research and development agreement and push and pull mechanisms include substantial alterations to the current medicines patent model. But many of these proposals do not contemplate complete departure from the existing system. The Medicines Patent Pool, for example, does not disturb patent holders’ rights to charge monopoly prices in middle and high-income countries. Similarly, the Health Impact Fund aims for patent-free development and distribution of drugs for neglected diseases, but this would not affect patent holders’ ability to charge monopoly prices for medicines with high market values. In contrast, some proposals call for the complete “delinkage” of medicine price from the cost of research and development. Instead, medicine price would correspond most closely with manufacturing cost. An example of full delinkage is the proposed Medical Innovation Prize Fund, which would reward innovations that impact public health while requiring the surrender of all monopoly patent rights.52 Delinkage proponents emphasize that the end of the medicine patent system would not mean the end of the private pharmaceutical industry, since effective drug innovators and efficient manufacturers would find ample reward via prizes and other incentives in a delinked system.lii Delinkage proposals are grounded in both the pre-TRIPS history of treating medicines as a public good, and the modern acknowledgement of a human right to health that is not dependent on a patient being fortunate enough to afford a medicine’s market price. Alternatives to the modern medicine patent regime are not without complexities and challenges. Push funding requires rigorous compliance monitoring and cannot guarantee success in every effort to discover innovative medicines. For prize systems, it is not easy to determine a monetary value and terms that provide sufficient motivation for innovators, along with robust returns for the prize funders. But none of the possible limitations is a match for the present skewed reward system, which results in unacceptable levels of suffering and death.The medicine patent system produces toxic results, and health rights advocates need to support effective and equitable alternatives. 3 A. Hill et al, “Minimum costs for producing Hepatitis C direct-acting antivirals for use in large-scale treatment access programs in developing countries,” Clinical Infectious Diseases (April, 2014) p.p. 928-936. 7 World Health Organization, The World Medicines Situation 2011: Access to Essential Medicines as Part of the Right To Health (Geneva: WHO, 2011), p. 1. Paul Hunt, Special Rapporteur on the right of everyone to the enjoyment of the highest attainable standard of physical and mental health, Human Rights Guidelines for Pharmaceutical Companies in Relation To The Access To Medicines, U.N. Doc. No. A/63/263, (2008). p. 15. Available at http://www.who.int/medicines/areas/human_rights/A63_263.pdf; A. Mannan and A. Story, “Abolishing the product patent: a step forward for global access to drugs,” in J. Cohen, P. Illingworth, and U. Schüklenk, Power of Pills (Ann Arbor, MI: Pluto Press, 2006), p.p. 179-89. 8 T. Fojo T et al. “Unintended consequences of expensive cancer therapeutics – the pursuit of marginal indications and a me-too mentality that stifles innovation and creativity” JAMA Otolaryngology Head and Neck Surgery (2014). 12 S. Perehudoff, R. Laing, and H. Hogerzeil, “Access to essential medicines in national constitutions,” Bulletin of the World Health Organization 88 (2010), p. 800. H. Hogerzeil et al., “Is access to essential medicines as part of the fulfillment of the right to health enforceable through the courts?” The Lancet 368 (2006), p.p. 305-311.Global Health Justice Partnership, A human rights approach to intellectual property and access to medicines, (New Haven, CT: Yale Law School and Yale School of Public Health, September, 2013), p.p. 11-24. 15 A. Mannan and A. Story, “Abolishing the product patent: a step forward for global access to drugs,” in Power of Pills: Social, Ethical and Legal Issues in Drug Development, Marketing and Pricing, Eds. J. Cohen, P. Illingworth and U. Schüklenk (Ann Arbor, Mi: Pluto Press, 2006) 183. 16 TRIPS Agreement, Art. 31, see note 1. 17 Ibid. at Article 6. 19 Ellen t’Hoen, The global politics of pharmaceutical monopoly power: drug patents, access, innovation, and the application of the WTO Doha Declaration, (Diemen, The Netherlands: AMB Press, 2009), pp. 44-62. 20 S. Sell, “TRIPS-Plus free trade agreements and access to medicines,” Liverpool Law Review 28 (2007), p.p. 64-74. 26 Lorenzeti. See note 14. 31 M. Kremer and R. Glennerster, Strong medicine, creating incentives for pharmaceutical research and neglected diseases, (New Jersey: Princeton University Press, 2004). 40 See Anderson, note 4. There are proven solutions to fix our broken system. People of faith can help build the movement for lifesaving reform.